Special Pug came in with a group of dogs from a puppy mill. He was being used as a stud dog. Needing a little extra TLC he came into our care. to him. He makes great improvement everyday. had to spend the first few years of his life living in such deplorable conditions. 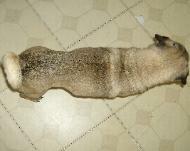 Our little man Tate is a special pug who deserves a second chance for a good life. costs for diagnostic tests and two day hospital stay is $650. hospital stay. We are accepting donations to help pay for Mr. Taters fund. funds to pay Mr. Taters' vet bill. Click here to link to this auction. bill. A big Thank you everyone who participated and to our winning bidder. great family that loves him. Needs some supervision & training. Gets along with other dogs.